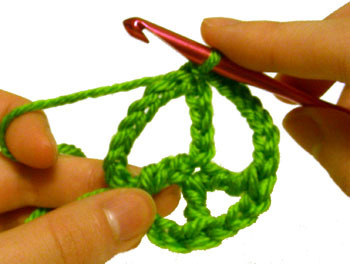 For those who have asked so kindly for detailed step by step photos of the Peace Sign Crochet Pattern, here it is! To see all the pattern specifications see the original pattern. 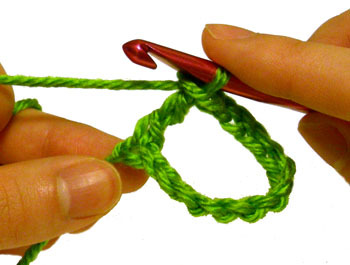 This tutorial still requires you to know how to crochet the stitches and will not go into detail about every single stitch. 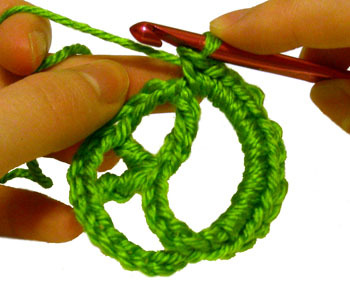 If you need need help with the stitches or crochet language, check out the crochet abbreviations chart, since it has links to the stitch tutorials. Here it is! 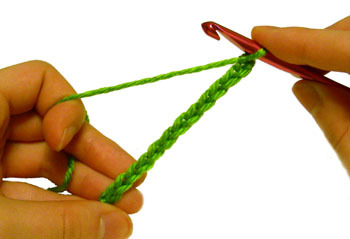 Finish off by cutting your yarn and weaving in your ends nice and neat. 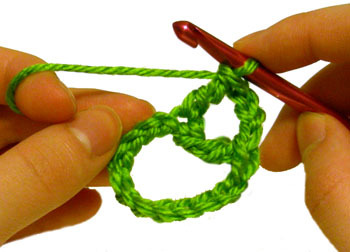 Make sure your single crochets in the chain spaces are spread out evenly. If they’re bunched together, it’ll make the peace sign lopsided. Need more help or have a question? Let me know! 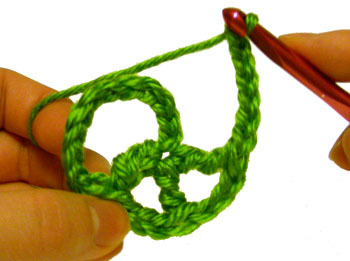 This entry was posted on Sunday, March 14th, 2010 at 12:01 AM by Rachel Choi	and is filed under Free Crochet Patterns, Tutorials and Help. You can follow any responses to this entry through the RSS 2.0 feed. You can leave a response, or trackback from your own site. 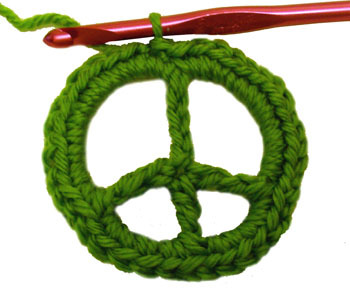 Crochet for peace! =) Every time I come here I’m so impressed with your detail. This is fabulous! 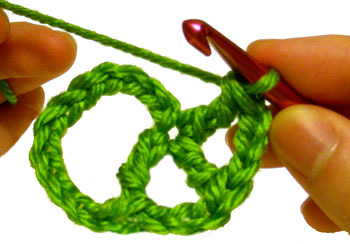 Hey, it could be modified to make something else as well….Sure does look similar to a pretzel in step six! I LOVE pretzels! This is awesome. You rock. How long Aproxx do these take to make?? 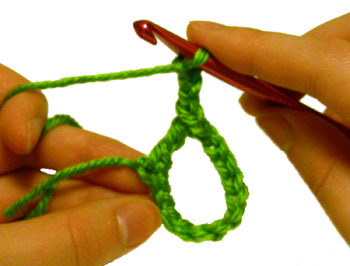 Hi Rana, it all depends on how fast you crochet. For me it takes about 5 minutes, since I’ve made tons of these. If it’s your first time, it’ll probably take longer. Hi Suzanne, try following this turorial step by step. It shows you how to make the lines in the middle. Im a visual learner. This is an AWESOME pattern, just want to know how you got from step 1 to step 2 and so on. When I try to follow, my pattern looks totaly different from what you have. I’m still a noobie in making other patterns…so I’m lost! Is there a video of some kind??? Hi Aki, this isn’t really a beginner’s pattern, but if you carefully read the instructions between each of the photos it tells you what to do to get the result shown in the photos. For example, the first picture shows the ch 13. Then the second picture shows you what it looks like after make the treble in the first chain made. 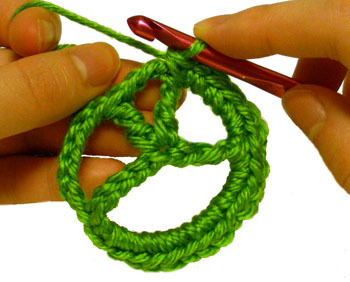 This is actually a really detailed tutorial, so once you know the stitches and basics of crochet, you can easily follow the pics! oh wait…got it!!! *heart healed* 😀 thanks!!! This was the first pattern I followed after my mom taught me to crochet triangles and it was super easy.Thank you! Hi, Thank you so much for all the effort you took to make a step-by-step picture tutorial. I was trying to follow the written instructions but I just couldn’t seem to figure it out after numerous tries. I was able to follow the pictures on the first try. I am making a Grrlfriend Market Bag for my husband’s co-worker. She wanted it in “hippy” colors so I’m making it in hot pink, orange, yellow and green. But it still didn’t look enough like a “hippy” bag. So I found your peace signs and I’m so excited. I’m going to make some and put them on the bag for her. Thank you so, so, so much!!! I hope it turns out okay. 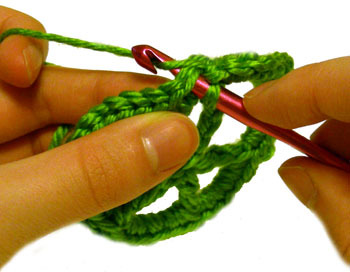 Can you explain how to triple crochet in the second step I am lost!! Hi Rachel! I love this pattern thank you so much for it i get all of it until i sc in the holes it look perfect but after i finish its the shape of an apple if you know something i can do or if im missing something you could help me with possibly? Mine is still turning out apple shaped. Is there something else I might be doing wrong? Am I doing it too tight or too loose? Brogan, if the part that’s dipping in is where the chains are, maybe those chains are too tight. 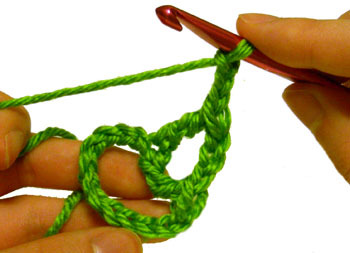 It’s very common for folks to make the chains tighter than the other stitches. 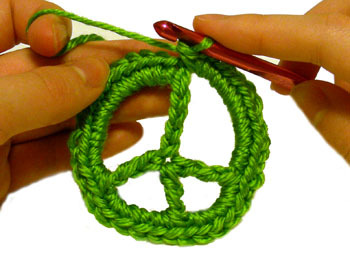 I would like to make an afghan using the peace sign as the center. I have only been able to find little one that might be used for magnets or other items. Does anyone have any suggesstions? I was so sure that I would try this over & over again & still not be able to get it right! I tried this 1 time & it came out right! I was so surprised. Of course it didn’t come out as neatly as yours, but I’d say its good for a beginner! I’m sort of a beginner but I’ve done other project before stumbling on this. reading the directions seems easy but I’m having troubles starting.. i did the 13 chains and i went to do the second step but the picture looks different than what i came out with.. Am i doing something wrong? is there a step in between that I’m missing? There isn’t any steps in between. After you chain 13, you’ll make a tr into the first chain that you made. 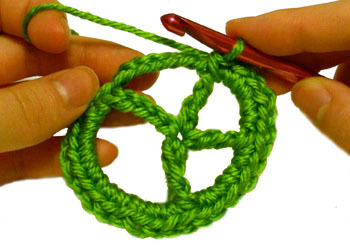 It will look like a circle or D shape after you make the tr. I wish all patterns were all step by step I’m a beginner again it helps if you know what it should look like.